Theresa and Tim Steadman bought their 1st Mazda in 1975, an 808 for $3800.00. They had it for 10 months and traded it for a 1976 Mazda RX4. In 1980 purchased a new Mazda 626 and kept it for 11 years. They wandered away from Mazda for a couple of years only to return and purchase a 2004 Mazda MPV which was traded 4 years later for their 2008 CX-7. They enjoyed the CX-7 so much they just traded for a new 2010 CX-7. Two of their daughters purchased Mazda Proteges, one in 2003 and the other in 2006. Their oldest daughter purchased her very 1st brand new car in 2008 being a Mazda 5. Their son Craig was the proud owner of the very 1st 2011 Mazda 2 sold by Kentville Mazda. For a Christmas gift to herself, their daughter Dedra continued with the family tradition and traded in her 2003 Protege for a new 2010 Mazda 3. 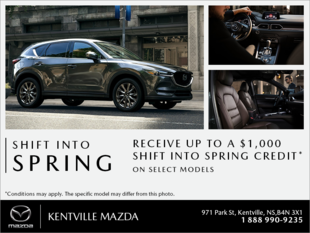 The Mazda tradition carries over to their extended family as Tim's sister and Father in law both are proud owners of Mazda 3 cars, all purchased from Kentville Mazda.